The fast race in the Ecommerce game has never run out of new challenges, especially for the Small and Medium Businesses (SMBs). Everyone needs to keep up with the constantly changing medium of information, which is the Internet. As technological advancements gave way for innovations in computing infrastructure and services for the Internet, the Internet itself became one of the providers of services through cloud computing.This brought the numerous benefits of cloud computing especially for the Ecommerce industry. This shift from the traditional networking of computers to a network connected thru the Internet opened more possibilities that favors the businesses that need to cut cost in network management. Cloud computing became a popular choice for businesses that they began spending for the apparent benefits of cloud computing, investing on cloud computing infrastructure and platform. The benefits of cloud computing attracted many that cloud computing service was able to tap its own market in the process. 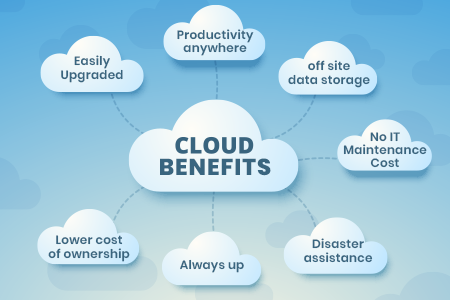 As the trend for cloud computing services grow beyond expected rate per year, the IT budget of companies grow to avail the benefits of cloud computing. The benefits of cloud computing has been the driving force behind the continuous rise of popularity of cloud computing, based on a study conducted by Cloud Security Alliance. According to the research, 86% of companies spend a part of their budget on cloud services, while 33% of organizations are ready to invest in cloud services. This is supported by a study conducted by Vanson Bourner, a market research company that summarized the benefits of cloud computing that win the favor of businesses for the service that cut costs, improve productivity, and improve time to market. The budget will no longer be short since cloud computing provides flexibility than traditional means. You don’t need to get stuck with fixed prices of service packages. You will be paying only for the resources that you need. It may be different from the previous usage you paid for, lower or higher, and all will still be well. Also, your capacity for heavy or light traffic into your site is flexible. This can avoid crashing your sites during peak seasons. You’re surely getting the most of your money’s worth. Since the computing resources of cloud computing is distributed among different computing infrastructure connected thru internet, there is less probability that it would experience downtime. This means that your business will be accessible to your customers. Cloud computing usually offers 99.99% uptime. So as long as end users have internet connection, they can access the applications anywhere. Mobility is an essential feature in this fast paced world where people have different gadgets for different needs. And it is such a convenience to be able to access your data anywhere with any gadget thru the internet. It will be relieving any end user from the burden of storing data physically to be taken somewhere else. In cloud computing, applications are supported by features meant for collaboration where people can access the same data and simultaneously contribute to it remotely. Gathering people in one place is a difficult task since most people are busy with so many things. Thus, applications that allow groups to work remotely using the data storage in one network that they can all access is certain innovation for an improved team productivity. Fewer data center worldwide while sustaining efficient operations means a collective effort to reduce the impact on the environment. Shared resources can lessen the usage of non-renewable resources that traditional network management demands. These are just seven among numerous benefits of cloud computing that continuously push its popularity in the Ecommerce industry.